Possibly Hellenistic or Roman 2nd Century B.C./1st Century A.D.
Hellenistic 2nd Century B.C./1st Century A.D.
Roman 2nd Century B.C./1st Century A.D.
Don Marius de Zayas, Stamford, Connecticut, c. 1950, as Greek; his sister-in-law, Barbara Harrison Wescott, Rosemont, New Jersey, mid-1950s; gift 1969 to NGA. Marius de Zayas, an artist, exhibitor, and writer on modern art, was born in Vera Cruz, Mexico, in 1880 and died in Stamford, Connecticut, in 1961. His work and career are discussed, with bibliography, in Douglas Hyland, Marius de Zayas; Conjurer of Souls [exh. cat., Spencer Museum of Art, University of Kansas, Lawrence; Philadelphia Museum of Art; and Center for Inter-American Relations, New York] (Lawrence, Kansas, 1981). He donated seven ancient sculptures to the Museo del Prado in 1943. Literature on the donation unaccountably describes him as a diplomat who served in the Middle East. 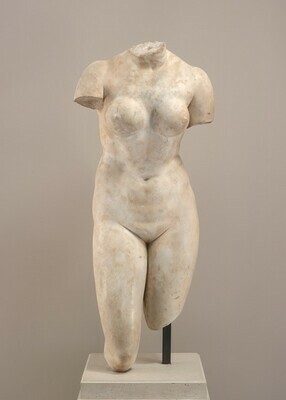 See A. Garcia y Bellido, "La Escultura Clasica del `Legado Zayas' en el Museo del Prado," Archivo Español de Arqueologia 25 (1952), 87-102, with a date of 1943 for the donation; Elias Tormo y Monzo, Museo del Prado; catalogo de las esculteras I: la Sala de las Musas (Madrid, 1949), 58-59; Antonio Blanco, Museo del Prado, catalogo de la escultura (Madrid, 1957), 8, 135-136, with a date of 1944 for the Zayas donations. Information on de Zayas from his son Rodrigo de Zayas and Lloyd B. Wescott. Rodrigo de Zayas indicated (letters, 25 February and 17 March 1986, in NGA curatorial files) that the present sculpture, although probably bought in New York, may have been acquired through a Greek dealer named Jeladakis who was active in Paris. Dietrich von Bothmer has kindly pointed out that a public sale of the antiquities of a dealer named Geladakis was held in Paris on 20 May 1904 and Carlos Picon has pointed to various listings for Geladakis in Paris in John Davidson Beazley, Attic Red-Figure Vase Painters, 2d ed., 3 vols. (Oxford, 1963), 3: 1885. Marius de Zayas referred to the torso now in Washington as "Greek" rather than "Hellenistic," according to Rodrigo de Zayas (letter, 17 March 1986). Rodrigo de Zayas, letter, 25 February 1986. Vermeule, Cornelius. Greek and Roman Sculpture in America: Masterpieces in Public Collections in the United States and Canada. Malibu, 1981: 174, pl. 141. Sculpture: An Illustrated Catalogue. National Gallery of Art, Washington, 1994: 108, repro.